Evil or profane speaking of God. The essence of the crime consists in the impious purpose in using the words, and does not necessarily include the performance of any desecrating act. The Jewish law is based on the case of the blasphemer, one of the mixed multitude that went out of Egypt with the children of Israel (Lev. xxiv. 10-23). He blasphemed the name of the Lord and cursed; was sentenced to be taken without the camp; and it was decreed that all who heard him should lay their hands upon his head, and that all the congregation should stone him. The judgment in his case was formulated in a general law in verses 15 and 16. The term "we-noḳeb shem Yhwh," used in verse 16 ("And he that blasphemeth the name of the Lord," A. V.), does not seem to signify that the mere pronunciation of the Ineffable Name was considered blasphemy, but that it was blasphemous to curse or revile the same. The later law, however, took the word "noḳeb" in the sense of "pronouncing," and declared that the Ineffable Name must have been pronounced before the offender could be subjected to the punishment provided by the Law. Both the lawgiver and the prophets speak of the blasphemer of God and of the king. To revile the king, who was God's representative, was apparently considered a species of blasphemy (Ex. xxii. 27; Isa. viii. 21). This is furthermore shown in the case of Naboth, the indictment against him being: "Thou didst blaspheme God and the king" (I Kings xxi. 10). Beyond the reference to cursing in the text of Leviticus, there is nothing in the Biblical laws to indicate what constitutes the crime, and nothing to show that, to prove blasphemy, it was required to prove that the blasphemer had uttered the name of God. The Mishnah, however, laying stress on the term "noḳeb," declares that the blasphemer is not guilty unless he pronounce the name of God (Mishnah Sanh. vii. 5). The Gemara goes further and extends the crime to an impious use of any words which indicate the sacred attributes of God, such as "The Holy One" or "The Merciful One." As long as the Jewish courts exercised criminal jurisdiction, the death penalty was inflicted only upon the blasphemer who used the Ineffable Name; but the blasphemer of God's attributes was subjected to corporal punishment (Sanh. 56a). According to Talmudic tradition, the Sacred Name was in early times known to all; but later its use was restricted (Ḳid. 71a; see Adonai; God, Names of). Even in taking testimony during the trial of a blasphemer, the witnesses who heard the blasphemy were not permitted to repeat the very words, but an arbitrary phrase was adopted to indicate the blasphemy. Thus, R. Joshua ben Ḳarḥah said: "Throughout the examination of the witnesses, 'Yosé' should be used for Yhwh, and they should say, 'Yosé shall strike Yosé,' to indicate the blasphemy" (Mishnah Sanh. ib.). At the conclusion of the trial sentence of death could not be passed by such testimony only, and it thus became necessary for one of the witnesses to use once the very words which they had heard. The court directed all persons not immediately concerned in the trial to be removed, and the chief witness was then addressed thus: "State literally what you heard"; and when he repeated the blasphemous words the judges stood up and rent their garments, that being the common sign of mourning. And the rents were not sewed up again, indicating the profound degree of the mourning. After the first witness had thus testified, the second and the following witnesses were not called on to repeat the identical words; but were obliged to say, "I also heard it thus" (Mishnah Sanh. ib.). The text of the law in Leviticus provides that the stranger, as well as the native born, is liable to punishment for blasphemy. 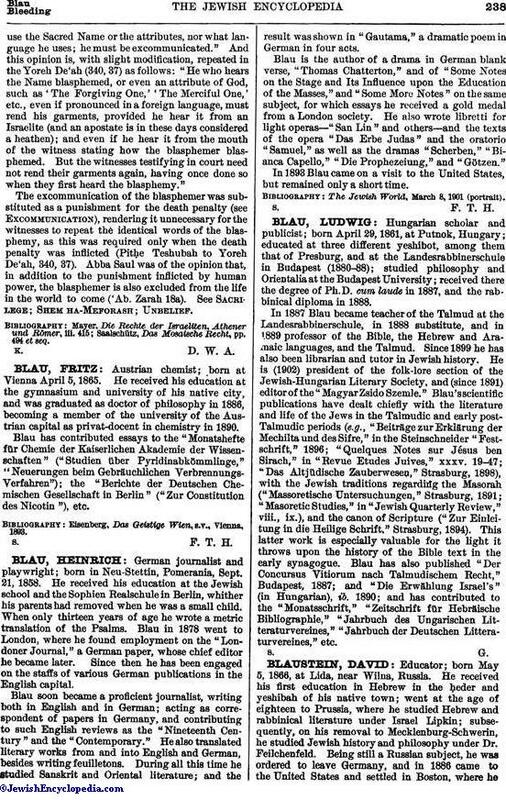 Talmudic tradition states that blasphemy was one of the seven crimes prohibited to the Noahides (Sanh. 56a), i.e., according to natural law. Although, according to Jewish law, a Jew who blasphemed a heathen deity was not guilty of the crime of blasphemy, Josephus ("Ant." iv. 8, § 10, after Philo, "Vita Mosis," 26; ed. Mangey, ii. 166) to the contrary notwithstanding, yet a heathen might be guilty if he blasphemed the name of the Lord (Baraita Sanh. 56a). The crime of the heathen blasphemer, though subjecting him to the penalty of death, did not oblige the Jewish by-standers to rend their garments. The Talmud bases the custom of rending the garments in such cases upon the Biblical precedent in II Kings xviii. 37), where Eliakim and others rent their garments when they heard the blasphemy of Rab-shakeh; and in order to bring this view into harmony with the practise requiring the rending of garments only on hearing a blasphemy by a Jew, the Talmud states that Rab-shakeh was an apostate Jew (Sanh. 60a). According to R. Ḥiyya, the rending of garments was no longer required after the fall of the Temple ("He who hears blasphemy nowadays is not obliged to rend his garments, because otherwise his garments would be nothing but tatters," Sanh. ib. ); for the criminal jurisdiction of the Jewish courts had ceased, and the fear of death no longer deterred the blasphemers. The later law, however, restored the practise of rending the garments. In an opinion rendered by Gaon Rab Amram ("Teshubot Geone Mizraḥ Uma'arab," collected by Joel Müller, No. 103) he says, "He who hears his neighbor blaspheme must excommunicate him in these days, no matter what language was used. This is the practise of the pious. It is not necessary that the blasphemy be in Hebrew, and it makes no difference whether the Ineffable Name or the attributes of God be mentioned, whether the offender be a Jew or a non-Jew, whether the language be Hebrew or any other. These distinctions were made to distinguish the capital crime from the lesser offense; but for purposes of excommunication, it makes no difference whether the blasphemer be a heathen or a Jew, whether heuse the Sacred Name or the attributes, nor what language he uses; he must be excommunicated." And this opinion is, with slight modification, repeated in the Yoreh De'ah (340, 37) as follows: "He who hears the Name blasphemed, or even an attribute of God, such as 'The Forgiving One,' 'The Merciful One,' etc., even if pronounced in a foreign language, must rend his garments, provided he hear it from an Israelite (and an apostate is in these days considered a heathen); and even if he hear it from the mouth of the witness stating how the blasphemer blasphemed. But the witnesses testifying in court need not rend their garments again, having once done so when they first heard the blasphemy." 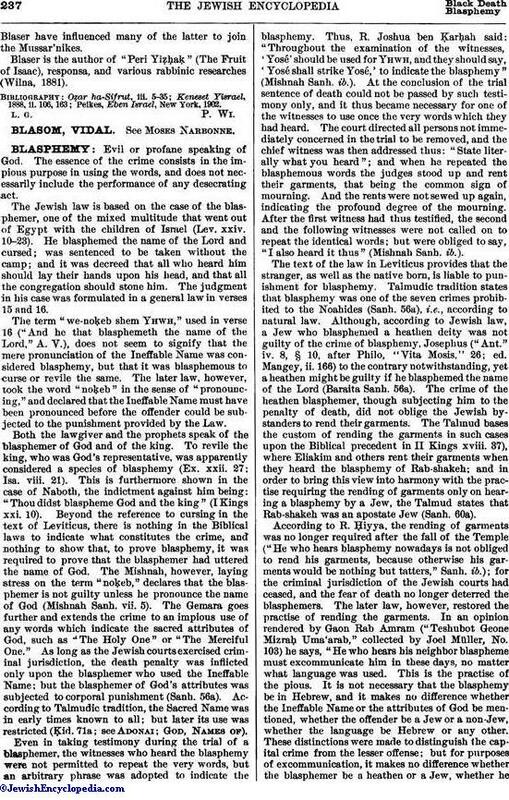 The excommunication of the blasphemer was substituted as a punishment for the death penalty (see Excommunication), rendering it unnecessary for the witnesses to repeat the identical words of the blasphemy, as this was required only when the death penalty was inflicted (Pitḥe Teshubah to Yoreh De'ah, 340, 37). Abba Saul was of the opinion that, in addition to the punishment inflicted by human power, the blasphemer is also excluded from the life in the world to come ('Ab. Zarah 18a). See Sacrilege; Shem ha-Meforash; Unbelief. Saalschütz, Das Mosaische Recht, pp. 494 et seq.